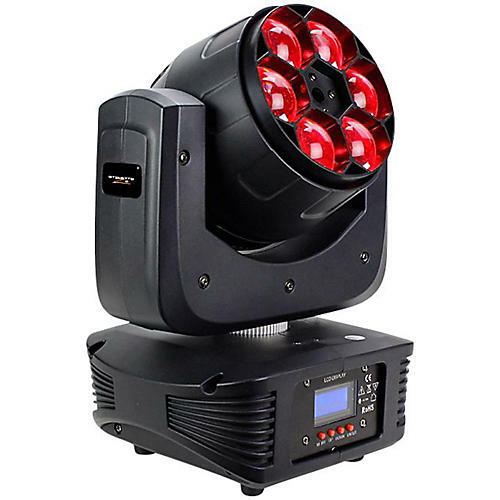 Delivering incredible fog-cutting abilities and tons of excitement to your next show, the ultra-sharp Stiletto Z6 moving-head fixture is powered by six multi-chip, 4-in-1 RGBW 15W LEDs. It also boasts an impressive 6.5-60° adjustable beam angle, thanks to its zoom feature. The Stiletto Z6 provides four user-selectable, 32-bit dimming curve modes that are flicker-free and at your disposable directly from the control panel or via DMX for smoother (and slower) dimming capabilities. Then, the fast and precise user selectable 360°/540° pan and 270° tilt of the StilettoTM Z6 make it a super aerial performer in a tiny, lightweight package! This fixture also comes equipped with an easy-to-use 4-button LCD control panel, attractive housing (it’s got all the right curves), industry standard powerCON compatible power I/O connections, 3-pin DMX I/O jacks, and a single secure quarter-turn “Omega” quick connect type clamp bracket, making this one intensively engineered, incredible moving head effect fixture.